Cramp bark (Viburnum opulus) is one of the most important herbs used for female reproductive health in Western herbal traditions. Native to North America, it is widely employed by medical herbalists, naturopathic physicians, and midwives. Although cramp bark is commonly used as a uterine antispasmodic, it is also used as a general antispasmodic, such as for bronchial spasms. 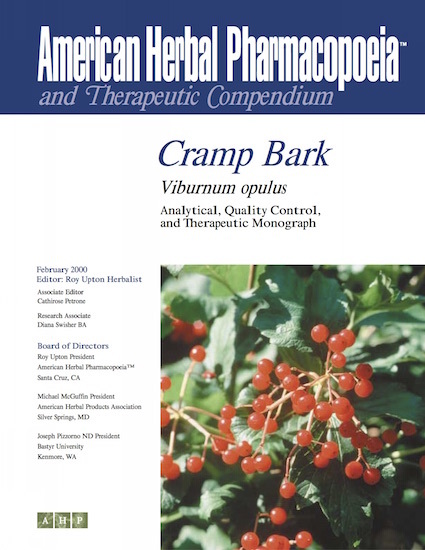 From a quality perspective, cramp bark is often adulterated with the closely related black haw (Viburnum prunifolium). While black haw is used in a manner similar to cramp bark, it is much less expensive than cramp bark. Analytical methodologies for differentiating between the species are provided in the AHP monograph.